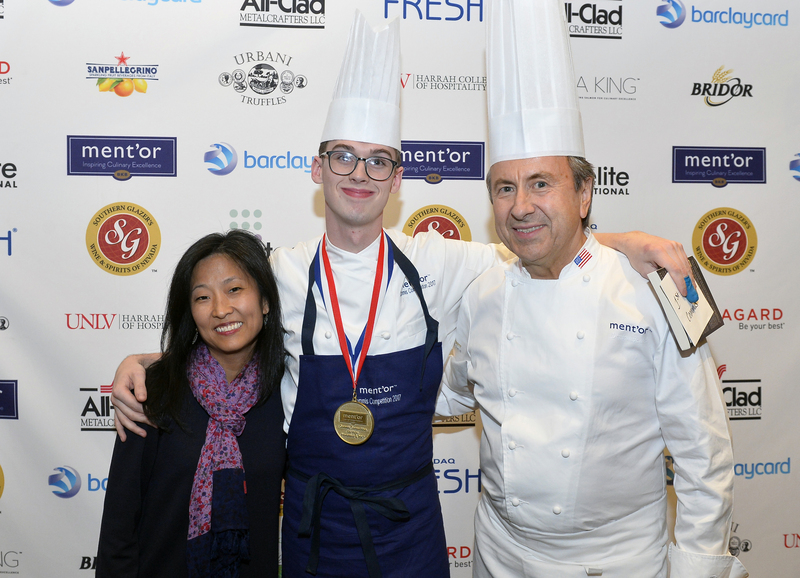 Hyde Park, NY – A student at The Culinary Institute of America has won the Ment’or Commis competition in Las Vegas, NV, earning the opportunity to stage with Team USA 2019 as it prepares for the Bocuse d’Or in Lyon, France, the most prestigious gastronomic competition in the world. Ethan Hodge, a senior in the college’s Bachelor’s in Food Business Management program, took first place, impressing the judges with his King Ōra Salmon Pavé, Green Leek Purée, Truffled Potatoes with Fines Herbes, Braised Fennel “Wing,” and Carrot and Mussel Emulsion with Smoked Salmon Roe. The college was well-represented at the competition. Four CIA students were among the six commis candidates selected by Ment’or, a nonprofit organization devoted to inspiring culinary excellence in young professionals. Joining Ethan were sophomores Sharon Hwang, Carson Moreland, and Madison Paras. The competition is modeled after the Bocuse d’Or, with each team featuring a selected protein—in this case salmon—and presenting the dish to a panel of chef jury members. Candidates were evaluated on excellence in overall taste, presentation, and kitchen organization. Judges included CIA graduate Philip Tessier, who in 2015 led the American team to its first-ever medal, a silver, at the Bocuse d’Or. Chef Tessier was also head coach for Team USA’s historic gold-medal victory at the most recent Bocuse d’Or earlier this year. He is deeply involved in Ment’or, working alongside Chef Keller, famed chef Daniel Boulud, and fellow CIA graduate Jerome Bocuse to help prepare the best young talent in America for the privilege and honor of representing the United States in France.